Welcome to the July “Summer Garden” freebie challenge. For this challenge, you must create your dream summer garden. It can be a vegetable garden, quaint English cottage garden, the gardens of Versailles or your favorite meadow in the summer. So your picture must contain plants and flowers. As BWSman says, "Please read them good and try to stay within them, they will not change throughout this month, so please don’t ask me to make any exceptions. Rules is rules. If you want to discuss one, feel free to bring it to the table here in this thread. We will all discuss it and reach a decision on anything." 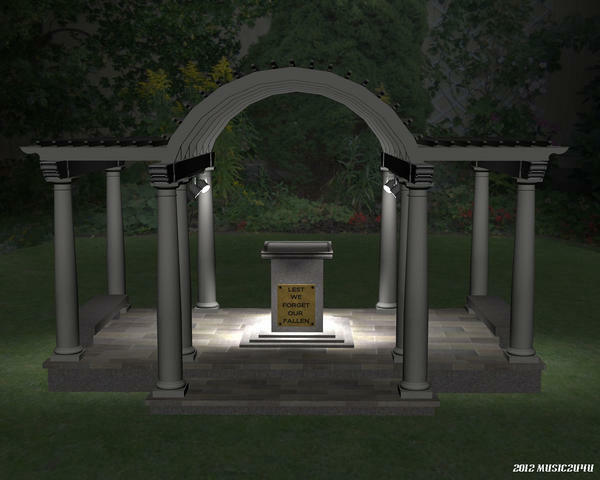 Music is offering all winners (including HMs) his Garden Memorial structure and something special for first place. Everyone entering the contest will receive a lovely $250,000.00 diamond necklace for Victoria 4. 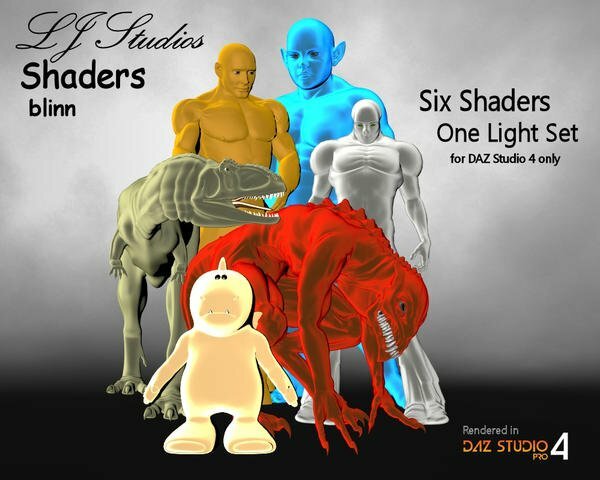 It will be in DAZ Studio 4.5 duf format so if you are still on DAZ Studio 4.0 this gift won't work for you. 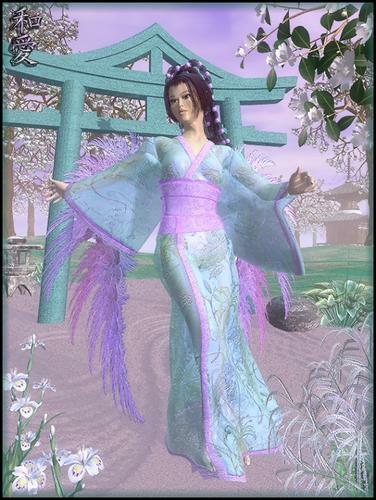 There is a directory containing the objs for Poser and earlier versions of Studio. The judges, the Music man, Music2u4u, robkelk and ZamuelNow. My court is complete and I thank the gentlemen for stepping up. I want to welcome you all and I hope you enjoy this year's July contest. Here is our lovely V4 model showing off her new necklace and below our lovely model is the banner if you want to use it. Well said DG...(PULLS A WATER GUN OUT! ).....now, hand over the necklace! Tries to run with the necklace, but gets hit in the face by one of Jeeperz pies, then gets wrestled to the ground by Dorsey and Lord Ganthor and cuffed. Well, my dream garden is a zen garden - lots of white sand, no flowers. So I doubt I'll enter this month ... which means I'm available as a judge. One of the donations I will give to ALL the winners, including HMs, will be my garden memorial for our fallen. You can put a statue of whatever you want on top of the center piece if you like. I will be making something else this month to give to the first place winner alone. Well Rob, thanks for the offer. It is now sealed but you still allowed to enter so I am not letting you off the hook yet. I think you reason for not participating is a little weak, in my opinion. Unless you are talking about the mini zen gardens. Don't get me wrong. Not trying to pressure you but you know those Japanese they love their environments, mountains, rivers, islands, meadows. You can make a zen garden that has a flowering tree and then the moss covered rocks and islands of grass. It is all about harmony. It would be great if someone tried to create a zen garden. Come to think about it I might try to do it. Would be fun to figure out how to make the sand areas. Well... I'm on vacation for a week, then I go back to the office and start doing two people's work until they hire a new person to replace the one who just left. So I'll be either too distracted or too busy to actually render... I think. I might try a bonsai garden, assuming I can find the right freebies. Don't hold me to that, though. Thanks Music and no robberies allowed in this thread. You have to earn that little pretty. Are you up for the challenge? Now that is a good reason. Bonsai garden, whoo yes! xfrog has two samples of bonsai, one is an azalea in bloom. You want the links?When I say flowers it does not have to be the showy ones. Flowers come in all shapes and forms, some not so pretty. Very pretty Cho! Those are lovely colors and I see the zen in there! I always try to wait to see if someone new will judge for the month, but if no one else steps up Dolly, I'll pick up the 3rd judging seat. But please everyone, feel free to jump in and take it from me, it's always good to see some newbies taking the judges chair, and you can still enter if you judge, you just can't vote for your own render. Thank you jeepers, you will be my judge-in-waiting, LOL. I finally have an idea for one of these things. How far outside of the box are we allowed to go? My dream garden isn't technically a garden, but has plants, and best suited in an aquarium. There is no stipulation that the plants and flowers have to be based upon real, but that there must be flowers and plants in the picture. You can have plastic flowers in you aquarium but you couldn't count coral as your plant because it is an animal so you need seaweed or sea grass to count as the plant. So if da' Real Man wants to show off his garden of plastic flowers and AstroTurf and if it is his favorite garden it is acceptable. Or if you are Captain Nemo and you want to click a pic of your underwater garden it will count. Hey half way there. Well if you don't you wont get a chance to have a $250,000 necklace for your V4. Oh and I am reworking my blinn shaders. Now that I have worked with shader mixer it's a wonder they worked at all. This time I have fixed the issues and so far I have 15 presets. I liked your tribute too. There was a new link with three outfits I did not have. Whoohoo! You are half way to having a render Takeo. You have a plant, an environment, and lighting. 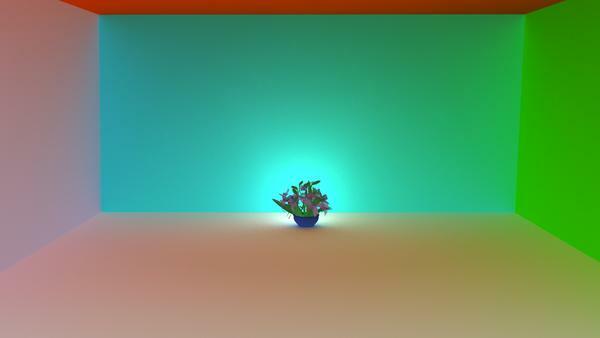 A few more plants and positioning of the camera and you have a render that might qualify. Genesis2 can use the jewels as well. As to my blinn shaders. A year ago this month I gave a set of them away as a gift in the freebie contest. The other day I was just playing around with the shaders and found to my horror they were not working. I have learned much since I did the set based upon your help. As a result I have created a larger more stable set of shaders. I was trying to say thank you, in a most awkward way, for the help you provided with my questions about shaders and Shader Builder. I also haven't try to really use the instancing feature so It's a good time to do that. Oh thank goodness. I sometimes get ahead of myself. Sounds like a plan on the generators and instancing. I used instancing on my "not an entry" entry for June's challenge. Tree generator for DAZ? most interesting. I might try my hand at judging for this. What all needs to be done? ZamuelNow... I hand the judging staff to you. I'm being silly but that is pretty much it. Now to see if I can remember where all those lovely freebie plants are stored away in my runtime. Thanks I am fond of gardens but I have a brown thumb I am afraid so rendering gardens seemed a good way to have one and keep it around for awhile.